Growth in large ecological datasets and large environmental synthesis projects has resulted in the need for a diverse workforce with technical data science skills. A variety of organizations support underrepresented groups entering the data science field through training, mentoring, and networking opportunities. However, many of these initiatives have been developed in isolation, limiting opportunities for an exchange of ideas and lessons learned. 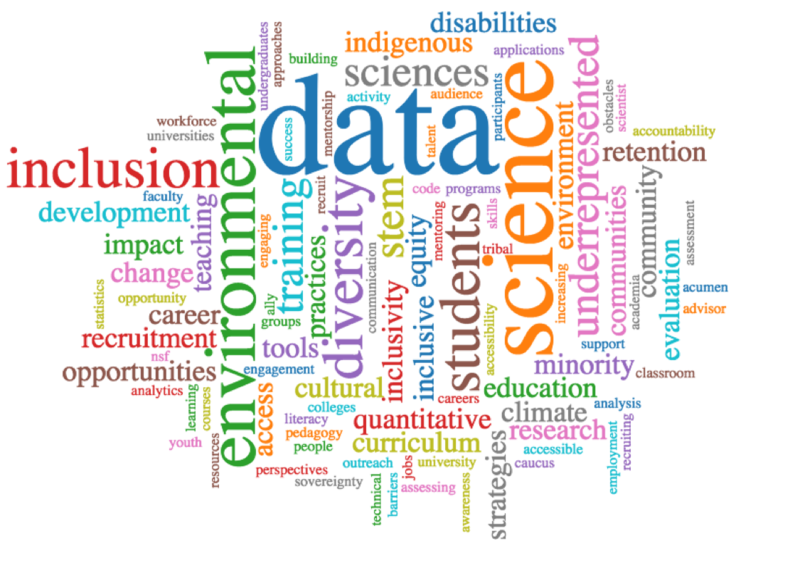 The Environmental Data Science Inclusion Network (EDSIN) is intended to strengthen initiatives across existing alliances and organizations to recruit and retain individuals from underrepresented groups in data science careers. Can't join in person? Participate from where you are! Click here for more information on participating remotely. Join the conversation by clicking “Request Group Membership” in the upper right hand corner of this page once you are logged in. To create a QUBESHub account, click here. The EDSIN conference is based upon work supported by the National Science Foundation under Grant No. 1812997. Any opinions, findings, and conclusions or recommendations expressed in this material are those of the author(s) and do not necessarily reflect the views of the National Science Foundation.